From: “Similarities between ancient Macedonian and today’s’ Macedonian Culture (Linguistics and Onomastics)” by Aleksandar Donski, celebrity historian from FYROM. Zeus asked Prometheus/Προμηθεύς to mold a human, which the crafty Titan did, molding him out of clay. It was the Golden Generation of mortals that first walked the earth, followed by the Silver one. Times were good for humanity. Everything was easy. Life was good. But then the Bronze Generation came to being, and things did not go so well. Humans became corrupt and impious. Zeus was not going to stand for this kind of insolence coming from the mortals. Something drastic had to be done! Deukalion/Δευκαλίων was a mythical king of Phthia/Φθία, in Thessaly/Θεσσαλία, the place where many years later Achilles was born. Deukalion was the son of Prometheus/Προμηθεύς and Pronoea/Πρόνοια. Pro-metheus and Pro-noea are etymological synonyms, and they both mean “forward thinking”; “thinking and planning ahead”. Prometheus was the one who (despite Zeus’s protestations had “provided” (the verb “to provide” in both ancient and modern Greek is tellingly prometheuo/προμηθευω and provisions are called prometheies/προμήθειες) the human race with the gift of Fire. Along with the fire, he also “provided” them with the knowledge and technology to use it for humanity’s benefit. Fire until then was in the exclusive usage of the Gods, especially of Zeus (thunderbolts were fire falling from the shy on earth) and of Hephestos/Vulcan (he controlled volcanic activity: fire from inside the earth). Deukalion was married to Pyrrha/Πύρρα who was his opposite in many respects: Her parents were the personification of foolishness: Pyrrha’s father was Epimytheus/Επιμηθεύς ( his name means the backward-looking, the conservative-thinking one) and her mother was Pandora/Πανδώρα (=the one full of gifts). Greeks used all the caustic irony in their arsenal when choosing her name, considering that she was the woman who opened the treasure chest of evils letting them escape to plague humanity ever after, allowing only Elpis/Eλπίς, Hope, to console the now wretched humans in their suffering. When Zeus caused the cataclysm to destroy the impious Bronze Generation of humans, Deukalion, adequately warned by his father Prometheus, created a water tight wooden cabin and hid in it with his wife. The cabin Deukalion had built floated on water, but once the high waters receded (the parallel connections with the Mythology of the Jews, the Egyptians and the Mesopotamians is obviously apparent), it finally touched on dry land on Mount Parnassus. Deukalion’s name sounds deceptively like “Zeus´ attractive one”, Deus/Δεύς (as Zeus was called in the Aeolian dialect spoken in Thessaly) and kalos/καλός, the handsome, good looking one. But while the part of Deus/Zeus, the supreme God of light and thunderbolts is not off the mark, it gets a bit more interesting: “Deu-” derives also from the verb Deuo / Δεύω which means: to moisten something, to wet, to soak in water. Zeus is is not only known for the fire he sends through his thunderbolts, but rain too (“βροχαι και θυελαι εξ αυτου προερχονται” / rains and storms have Zeus as a source and (Ζευς Υει = Zeus rains). The second part of Deukalion’s name “-kalion” comes from the noun kalia / καλια or kalias / καλιας and which means wooden cabin. Deukalion, therefore, is of the water, but not salty water of Poseidon, it is from the water that Deus / Zeus sends from the skies, and his wife is his material opposite, she is Pyrrha/Πυρρα of Pyr/Πυρ : Fire! She is the Fiery one. The two elements of primordial creation, water and fire, meet at the top of dry earth on top of Parnassus, the poetic mountain of the Muses. And after consulting the Delphic Apollo who tells them to close their eyes and walk and throw behind them the bones of their mother, Pyrrha understands: they pick up stones and start throwing them behind them. The three elemental units of ancient cosmology and creation : Water, Fire and (the bones of) Earth meet and blend in the clear, mountain top Air of the divine Parnassus, and out of their sacred union a new nation of people is being born: the progenitors of all the Greek tribes are born that same day, one after the other, as laas/λααs (stone) after laas is falling, one after the other behind Deukalion, the one of moisture and Pyrrha the one of fire. 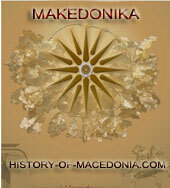 It is incidentally interesting to note that the names Magnes / Μάγνης and Macedon / Μακεδων, Magnesia/ Μαγνησία and Makedonia /Μακεδονία linguistically are very closely related words. This in itself betrays a deeper fraternity between the two tribes which is attested in the very revealing mythical connection anyway (…”two sons, Magnes and Macedon”…: You cannot get any closer than being brothers!). Both names are derivatives of the Greek root word Mak- / Μακ- (makos / μάκος and mekos / μήκος mean length in Greek and are still very much in usage today in modern Greek: Μakrys / Μακρυς / long and Mekos/Μηκος/long). The original Indo-European root word: *mak which meant “length” and it has remained unchanged in Greek, through ancient times. The same word appears in the Greek word Μακροοικονομικά/Makrooeconomika, spelled in English as Macroeconomics/Large scale Economics. Macro is used in this case as “large scale” to contrast with Micro/small scale. This was the sacred creation myth of the ancient Greek cosmology, as it was poetically narrated mainly by Hesiod/Ησίοδος (about 700 BC, Aeolis and Boeotia), and later on by Αpollonios the Rodian / Απολλώνιος ο Ρόδιος (born 270 BC in Alexandria) and others over the centuries. In this Mythical context, Pyrrha’s destiny, as we saw, was to be the mother or grand mother of all Greeks. Hesiod’s books, along with Homer’s became the sacred bible of Greek religion, so what was told in them was taken very seriously and at face value by the ancient Greeks. In passing I find the opportunity to mention and to stress here that Hesiod’s sacred pronouncements relating to the fraternal blood relationships between the progenitors of the Ionians, the Dorians, the Aeolians, the Locrian Aetolians, the Magnetian Thessalo-Pierians, the Epirotans and the Macedonians, counted, for the ancient Greeks, sacred volumes more than any demagogic pronouncements by any Athenian orator, who had political knives to grind and geopolitical reasons to raise his fellow citizens´ fears and wreath against Philip II, the restless king of Macedonia. If Hesiod classified the Macedonians as one of the Greek tribes, then so it was, for the ancients: end of the story! More than one thousand and four hundred years after Hesiod had written his assessment on the Macedonians and the other Greek tribes, several Slavic tribes, the Mijaci/Мијаци and the Brsjaci/БРСЈАЦИ and others, crossed the Danube, being pushed by or sometimes following and joining the Turkic Avars in their attacks into the Eastern Roman Empire, Btzantium. These Slavic tribes had been scraping a living just north of the Danube, for some time, but this was only a temporary stop, in the long descent of the Slavs from the Pripet marshes of Belorussia, which eventually ended inside Byzantine lands of the middle and lower Balkans. Twelve hundred years after their arrival, some of the descendants of these Mijacs and Brsjaks suddenly decided that Hesiod was wrong: The Macedonians were not Greek after all, they claimed, but Slavic. 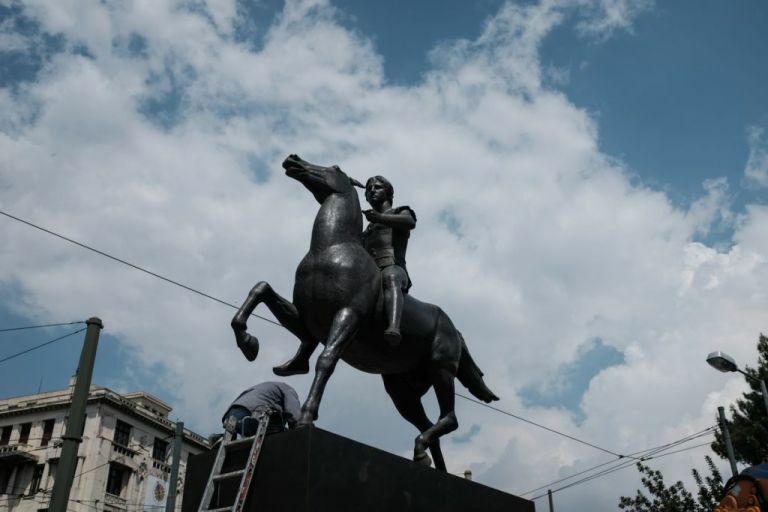 They proclaimed themselves to be the true and only Macedonians, the Makedonci. 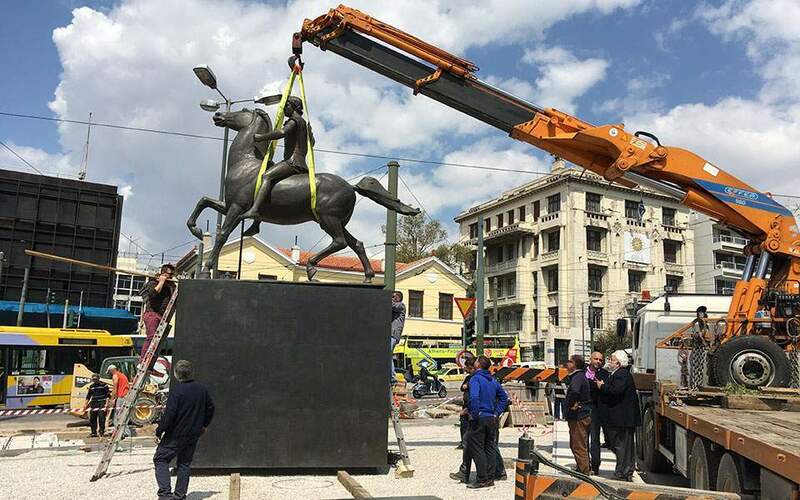 Leaving the government of the twenty first century Mijaci/Мијаци and Brsjaci/БРСЈАЦИ of Skopje busy erecting statues to Alexander the Great, trying to prove their imaginary ancient Makedonist laurels, we now return to Pyrrha. Pyrrha was considered by the Greeks to be the first mortal person ever born. The province of Thessaly was also called Pyrrhaea/Πυρραία after her descendants who stayed and lived there. Deukalion took Pyrrha and they walked to Epiros/΄Ηπειρος, where they founded the temple and oracle of Dodona/Δωδώνα – Dodone/Δωδώνη. They dedicated this temple to the worship and divine honor of father Zeus. History tangles its branches with mythology and following the Trojan war, Neoptolemos/Νεοπτόλεμος (=Young Warrior) the son of Achilles/Αχιλλεύς leaves his paternal Thessalian Phthia/Φθια and follows his grandmother’s footsteps and establishes a new kingdom among the Molossian Greeks of Epirus. The first king of the Molossian Epirotans was another deity of fire, Phaethon (from Phos/Φως (=Light as in: Photographia/Φωτογραφία) derived from: *bheh2 = to shine), the one full of light, the son of Helios/΄Ηλιος (*sehaul), the solar God. The ancients have left us the information that the ancient inhabitants of Epiros were the Selloi/Σελλοί [whose name is related to the Selas / Σέλας , which means “light”, as in Boreion Selas/Βόρειον Σέλας, the northern lights – the Aurora Borealis of the Latins. Selene is incidentally the name of the “night light”, i.e. the moon, in Greek. Selene is also called Selana, by Sappho, in her Aeolian dialect, and Theocritos tells us “ἀλλὰ Σελάνα, φαῖνε καλόν / alla Selana phaine kalon / but Selana lights up beautifully.” Theocritus, Idylls 2.10. Selana or Selene is obviously from the same linguistic root as Luna, the moon of the Latins. The fire and light connection is everywhere here: Pyrrha, the grandmother of the Greeks, Pyrrhos – Neoptolemos the son of Achiles and first king of the Pyrrhidae dynasty, and finally Phaethon and finally the Selloi. Selloi/Σελλοι, was also the name by which the priests of Zeus in Dodona were known by. Some ancient authors, and none other than the Macedonian Aristotle himself among them, interestingly claim that the common name of the Greeks “Hellenes” to have derived from these Eperotan Sellenes – Hellenes. 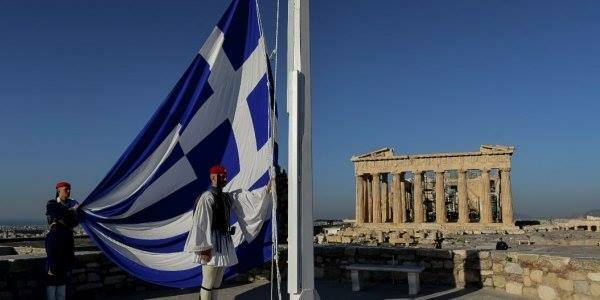 I need to make a parenthesis and insert a few notes here: The first is on “Hellas”. As Aristotle tells and all the ancients knew, Hellas was originally only the name of the land around Thessaly. It was only much later that the other Greeks adopted this name as their own ethnonym. Additionally, not every place that was inhabited by Greeks was called Greece/Hellas. Greeks of southern Italy re-named their place into Megale Hellas, Greater Greece, Magna Graecia of the Latins, but this were the exception. Greeks lived in Asia Minor for millennia, and they never called their land Greece/Hellas. They instead called their homeland Ionia, Aeolia, etc. and they were called by the other Greeks Ionians, Aeolians, etc. The Macedonians were likewise considering themselves of Greek stock, but they called their land Macedonia, which was considered to be north of the original Hellas proper (south of Olympus). Ethnically though, everyone accepted Macedonia, especially after the expulsion or the eventual Hellenization of the Paeonians and the remaining Thracians to be unquestionably a Greek Land. None other than Strabo the Geographer declares this: Ἐστι µέν οὖν Ἑλλάς καί ἡ Μακεδονία / Esti men oun Hellas kai he Makedonia: Macedonia of course is part of Greece too. Another issue is the name Graeci and Graecia. Some, who never read their Hesiod or Aristotle, ignorantly claim that these are names that the Romans attached to the Greeks, but this is plainly wrong and unhistorical. The Romans heard the Greeks of southern Italy (Megale Hellas) call themselves Graeci, (Graecoi and Hellenes were both acceptable ethnic names for the Greeks themselves, as Achaeoi, Danaoi or Argoites were in the earlier, Homeric times), so the Romans simply adopted it. Back to Epirus again, and to Dodona, which is the place where tribes of Pelasgians and Hellenes came together and under the divine light of Helios they worshiped Zeus. “Ζευ άνα, Δωδωναίε, Πελασγικέ, τηλόθι ναίων Δωδώνης µεδέων δυσχειμέρου, αµφί δε Σελλοί σοι ναίουσ’ υποφήται, ανιπτόποδες, χαµαιεύναι…” / Zeus king, Dodonian, Pelasgian, living afar, being master of the cold Dodona around which live the Selloi, your prophets, the dirty footed who sleep on the floor…” Homer, Iliad Π 233 – 235. Neoptolemos, the son of Achilles was also called Pyrros (which means of the fire, but also red-haired, as some say he was) and established as we said his kingdom among the Molossians. This dynasty was called the Pyrrhidae/Πυρρίδαι after him. Years later, a Pyrrhidaean prince of the Molossians named Myrtale/Μυρτάλη was betrothed to the young king Philip / Φίλιππος of the adjacent kingdom of Macedonia. When his horses won the tethripon (four horse) chariot race for him, Philippos II renamed his queen Olympias/Ολυμπιάς to commemorate his becoming an Olympian victor himself. A succession of kings some of whose names have come down to us, like Tharrhypas / Θαρρύπας, Arybas/Aρύβας, Alcetas/Αλκέτας, Alexandros/Αλέξανδρος (brother of Myrtale-Olympias) and Aeacides / Αιακίδης, who succeeded him after his (Alexander the Molossian) untimely death in Italy. Aeakides had three daughters, Phthia, Deidamia and Troas, and a son, whom he named Pyrrhos / Πύρρος. Pyrrhos (319 – 272 B.C) had shaky, dangerous and politically eventful childhood, when at two years of age, after the deposition of his father from royal power while he was fighting against Cassandros/Κασσανδρος/Cassander οf Macedonia, he was rushed to Macedonia and from there to Illyria, where he grew up. Pyrrhos returned to claim his kingdom and established himself as one of the most memorable of the Hellenistic kings. Being a second cousin of Alexander (through his aunt Myrtale/Olympias), he was as fierce and Homeric in battle as Alexander, reminding the older Macedonian soldiers of their fabled king, Alexander the Great. 8 ] This conflict did not fill the Macedonians with wrath and hate towards Pyrrhus for their losses, rather it led those who beheld his exploits and engaged him in the battle to esteem him highly and admire his bravery and talk much about him. For they likened his aspect and his swiftness and all his motions to those of the great Alexander, and thought they saw in him shadows, as it were, and intimations of that leader’s impetuosity and might in conflicts. 2 That night Pyrrhus dreamed that he was called by Alexander the Great, and that when he answered the call he found the king lying on a couch, but met with kindly speech and friendly treatment from him, and received a promise of his ready aid and help. “And how, O King,” Pyrrhus ventured to ask, “when thou art sick, canst thou give me aid and help?” “My name itself will give it,” said the king, and mounting a Nisaean horse he led the way. So he attacked and took over Berroea and forced Demetrios to turn back from his war against another Macedonian King, Lyssimachos. καταλαμβάνει τὴν Βέροιαν, καὶ τὸ πλεῖστον αὐτόθι τῆς στρατιᾶς ἱδρύσας, τὰ λοιπὰ προσήγετο διὰ τῶν στρατηγῶν. he took possession of Beroea and then, having established the greater part of his forces there, he proceeded to subdue the rest of the land through his generals. ὅθεν ἐπιστρέψας ἐπὶ τὸν Πύρρον ἦγεν ὡς ξένον καὶ μισούμενον ὑπὸ τῶν Μακεδόνων. ἐπεὶ δὲ παρεστρατοπέδευσεν αὐτόθι, πολλοὶ τῶν ἐκ τῆς Βεροίας ἀφικνούμενοι τὸν Πύρρον ἐνεκωμίαζον ὡς ἄμαχον μὲν ἐν τοῖς ὅπλοις καὶ λαμπρὸν ἄνδρα, πράως δὲ καὶ φιλανθρώπως τοῖς ἡλωκόσι χρώμενον. Therefore he turned back and led them against Pyrrhus, with the idea that he was a foreigner and hated by the Macedonians. But after he had pitched his camp over against Pyrrhus, many Beroeans came thither with loud praises of Pyrrhus; they said he was invincible in arms and a brilliant hero, and treated his captives with mildness and humanity. 8] τῶν μὲν ἄλλων βασιλέων ἐν πορφύραις καὶ δορυφόροις καὶ κλίσει τραχήλου καὶ τῷ μεῖζον διαλέγεσθαι, μόνου δὲ Πύρρου τοῖς ὅπλοις καὶ ταῖς χερσὶν ἐπιδεικνυμένου τὸν Ἀλέξανδρον. 8] The other kings, they said, represented Alexander with their purple robes, their body-guards, the inclination of their necks, and their louder tones in conversation; but Pyrrhus, and Pyrrhus alone, in arms and action. ὥστε τοὺς Μακεδόνας σύνθημα προστρέχοντας αἰτεῖν, ἄλλους δὲ κλάδους δρυὸς ἀναστέφεσθαι διὰ τὸ καὶ τοὺς περὶ ἐκεῖνον ἐστεφανωμένους ὁρᾶν. ἤδη δὲ καὶ πρὸς αὐτόν τινες ἐτόλμων λέγειν τὸν Δημήτριον, ὡς ὑπεκστὰς καὶ προέμενος τὰ πράγματα καλῶς δόξει βεβουλεῦσθαι. 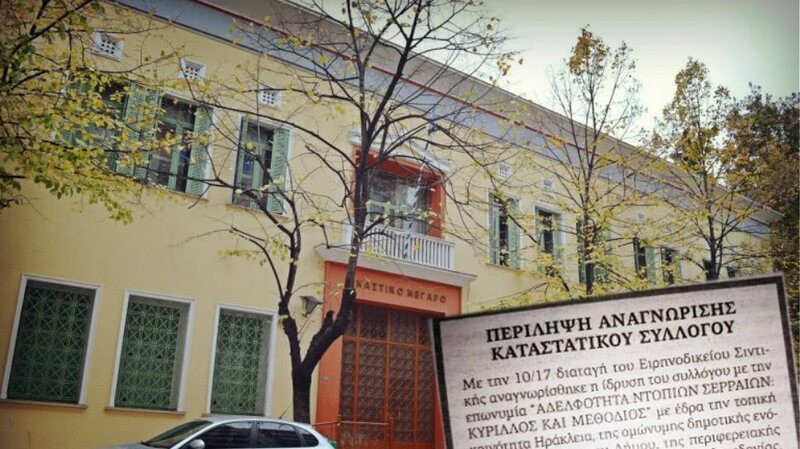 τούτοις τοῖς λόγοις ὅμοιον ὁρῶν τὸ κίνημα τοῦ στρατοπέδου καὶ φοβηθεὶς κρύφα διεξέπεσε, καυσίᾳ τινὶ καὶ λιτῷ χλαμυδίῳ περιστείλας ἑαυτόν. ἐπελθὼν δ’ ὁ Πύρρος ἀμαχεὶ παρέλαβε τὸ στρατόπεδον, καὶ βασιλεὺς ἀνηγορεύθη Μακεδόνων. This signaled the end of Demetrios’s army, and the Chinese strategist Sun Tzu would have been very proud of Pyrrhos: “Hence to fight and conquer in all your battles is not supreme excellence; supreme excellence consists in breaking the enemy’s resistance without fighting – Sun Tzu”. He went on to fight many battles, in Thrace, Macedonia, and Epirus. He fought and defeated the Romans in two major battles, first being the battle of Heracleia (280 BC), after which he marched on to Rome, but realizing that his army was not as large as was required for a siege and capture of such a large city, he turned back having come as close as 50 kilometers from Rome’s walls. He fought against the Romans a second time, in the battle of Asculum (279 BC). giving rise to the now famous expression: Pyrrhic victory / Πύρριος νίκη, to henceforth describe a victory won at such a great cost that should be considered as bad as a defeat. Pyrrhos, restless as usual, went south to help the Sicilian Greeks against the encroaching Carthaginians. They eventually proclaimed Pyrrhos king of Sicily, then disillusioned with his dictatorial ways asked him to leave. One more battle fought against the Romans, and unable to find fresh, new war-hardened recruits among south-Italian Greeks, convinced him to return to Greece. He fought against the Spartans in a not so glorious battle against Spartan old men and belligerent Spartan women who were fighting on a ditch they had hastily dug outside of unfortified Sparta, but he failed. On his return, he went to help his supporters in the city of Argos, but he died in the narrow streets of ancient Argos. Most of the information and most all of the quotes on the life of Pyrrhos I took from Plutarch’s Parallel Lives/Πλουτάρχου, Βίοι Παράλληλοι, a monumental collection of biographies written by the Plutarch/Plutarchos/Πλούταρχοs, circa 45–120 CE. His 46 Lives/Bioi are in “Greek and Roman” pairs: He paired every Greek statesman, general, orator etc, that he presented, with a Roman equivalent. The Greek orator Demosthenes was paired with the Roman Cicero. The Greek statesman Demetrios Poliorcetes was paired with the Roman Antonius. 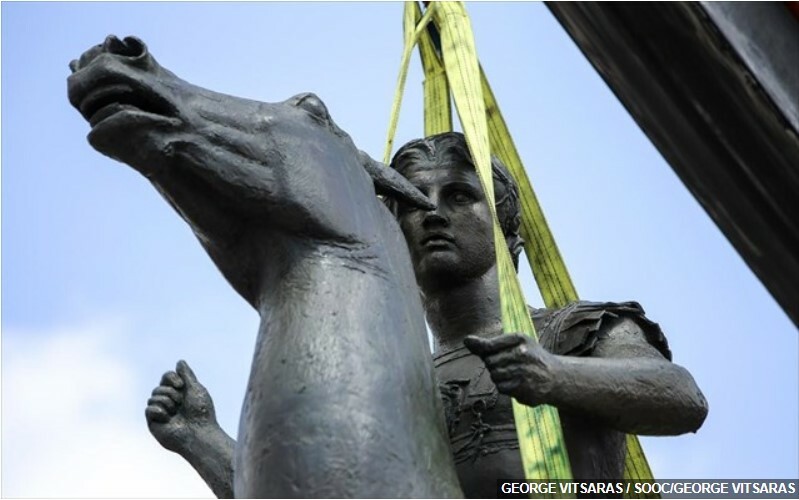 The Greek marshal-statesman Alexander the Great was paired with the Roman Julius Caesar. The Greek marshal-statesman Phillipos B’ was paired with the Roman Scipio Africanus. (both biographies are now lost). Greek marshal-statesman Pyrrhos was paired with the Roman Gaius Marius. Unlike some modern Balkan chauvinists, bent on history falsification, the ancients knew their history very well. They knew very well who was a Greek and who was a Roman. Maybe the ones who try to claim Alexander, Philip, Aristotle or Pyrrhus as Slavic (or even Albanian, for that matter), should take note of what the ancients wrote in their own time. At that time, the Greeks and the Romans had no idea of the whereabouts of the Slavs (or the Albanians), both of whom appeared in history and in the present location in the lower Balkans several centuries later. What would have been the name of Pyrrhos/Πύρρος, had he been a south Slav today? Pyrrhos/Πύρρος and (in feminine form) Pyrrha/Πύρρα evidently mean “the one of fire”, the person that is made of or is born of: pyr/fire. In a less poetic way, which obviously does not apply to the name of a king or a goddess, it is also used to describe a red-haired person or “the reddish one”. Back to our question now: What would have been the name of Pyrrhos/Πύρρος, had he been a south Slav of the middle ages, or of today? We do not need to go too far searching for it; a beautiful equivalent Slavic name already exists in Bulgarian: Ognyan/Огнян, “the one of fire” (Female: Ognyana/Огнянa), as derived from Ognen/Огнeн the Slavic and, particularly in this case Bulgarian, word for fire. (1)The Oxford introduction to Proto-Indo-European and the Proto-Indo-European world, J. P. Mallory, Douglas Q. Adams). (2) Women’s Catalog, Hesiod, Oxford Classical texts. Ησιόδου Γυναικὠν Κατάλογοι. (3) Iliad, Homer. Ομήρου Ιλιάς. Was it Alexandrovski the Greatski? Makedoskata? dont think so. Think these guys are making themselves a laughing stock most of the time. Its ok to use the term Macedonia but qualify it properly, serbobulgarian-macedonia, slav-macedonia. And realise the core of Macedonia has always been Hellenic.